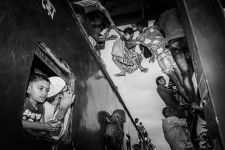 I am Tonay Roy Sagar, Bangladesh based photographer. I was born in Mymensingh city, Bangladesh in 1993 and passed my childhood in the city. I have been graduated on BBA(Major in Human Resource Management) from Southeast University, Dhaka in 2015. After the graduation, get started my photography journey by studying on basic photography course &amp; foundation photography course from Pathshala South Asian Media Institute in 2016. My photo story “Harsh Reality” have been awarded as a “Honorable Mention” in 1st VOHH International Foto Fest 2018 and several times awarded in some national photo exhibitions and contest. My photograph published in a Bangladesh based newspaper “The Daily Ittefaq” in January, 2018. I always believed in Street Photography as a motivation for gaining more knowledge about variant of human activity, variant of human physiology &amp; sundry kind of story of human. I want to know &amp; show the hidden story of the suffering people, real life &amp; the street life to the world. My Photography has been exhibited in several galleries such as Drik gallery in Dhaka, National Art Gallery in Dhaka, Photobank Gallery in Chittagong, Ramakrishna Mission Vivekananda University in India, Rabindro Bhaban Gallery in India and among others. Nowadays I live in the Dhaka city, Bangladesh.